Well the reprieve for Fallen Earth has expired. My current subscription is up tomorrow and I’ve set it not to renew. I’ve played maybe an hour in the last month. It is a good game and pretty fun, but the setting just hasn’t drawn me in. I don’t mean the game isn’t immersive, because it definitely is. Maybe it would be more correct to say that the setting didn’t engage my imagination. When I play LoTRO or Champions, I’m not just grinding quests or mobs. I have an inner dialog going on where I think about why my character is doing what he’s doing and what he thinks of the events he’s experiencing. I get very attached to my MMO characters and most of them have a background story. Often the story develops while I’m playing and I don’t always write them down, but any character that I play for a while develops some kind of background. Even with my general lack of interest, I might have kept the subscription active for another month or two in the hopes that something would click for me. Unfortunately, my MMO schedule is going to get more crowded over the next six months, not less. Star Trek Online is in closed beta now, open beta is planned for late January, and release is February. My interest in LoTRO has resurged lately, partly because of the coming Mirkwood expansion and partly because of a good kinship I joined. I’m also continuing to enjoy Champions and EVE Online. If anything, I may have to take a break from EVE when STO comes out, depending on what the available subscription options are and how well the beta goes. So unfortunately, Fallen Earth, its not you, its me. I hope we can stay friends. As a former XP user who skipped Vista, the UAC functionality is something new that I’m learning to deal with. I’m sure a lot of people just turn it off, but I’m trying to find ways to work within the security setup. I’m happy to click on a UAC prompt when I’m installing a program, that’s not something I do daily, but I don’t want to click on a prompt every time I launch Xfire or Steam. Xfire requires it be run in admin mode. Steam doesn’t have to be run that way, but Fallen Earth (which I bought through Steam) does. If you run a game in Steam that requires it be in admin mode, but Steam is not, then you get this very unhelpful message. Of course the game is actually available but you either have to run the program directly from the SteamApps folder in admin mode or you have to launch Steam in admin mode. Either way you’ll get a UAC prompt. Every time. I’ve changed my mind about letting Fallen Earth expire on the 22nd when my free month is up. Partly based on the Patch 1.1.0 release, and partly from peer pressure. I’m not committing myself to a multi-month subscription yet, but $15 is well below my impulse buy threshold. My character name is Brian Kae. Last month I talked about the four MMO’s I was trying (Aion, Fallen Earth, Champions Online) or re-trying (Age of Conan). Of the four, I’m only planning to continue playing Champions Online. Along with LoTRO and Eve, this leaves me with two lifetime and one monthly subscription (actually two 6-month subs since I have two accounts on Eve). I let Age of Conan expire last week, and this retry marks the least amount of progress I’ve ever made in the game. Generally when I retry the game I create a new character and get about halfway through Tortage. This time around, I barely got into Tortage. I may go back if something huge changes with the game, but I’m not sure anything would make much of a difference. The graphics are good and the combat is fun, but I just don’t have any interest in the world or the story. I cancelled my Aion subscription yesterday. Aion is still playable until the 29th, but I doubt I’ll spend any more time on it. Every time I’ve sat down at my PC recently to play a game, I’ve found myself launching Champions Online instead. I think the shine on Aion rubbed off during beta when I hit the mid-teens. I was especially disappointed to find that flight was not intended for exploration or travel. I’m aware of the lore reasons, but Aion is not based on a movie or book series, the lore is there to support the gameplay not vice versa. The queues and faction locks just served to keep me from trying to rekindle my interest during the initial launch. Even still, I might have spent more time with the game except that most of the people I know playing were scattered across different servers, and I found it difficult to decide where to roll. One thing I know I didn’t want to do was reroll and go through the 1-10 experience multiple times. Of the games I’m cutting, Fallen Earth was the most fun for me, and I seriously considered staying subscribed just to play off and on and support the developer. In the end, I decided to let the subscription lapse because Fallen Earth and Eve both fulfill the same need for me and I’m much more invested in Eve. I also prefer the slower pace of combat in Eve. Of all of the games I’m dropping this month, Fallen Earth is the only one that I see myself coming back to at a later date. Most of my playtime the last few weeks have been spent in Champions. There are definitely some roughs edges in this game just like there are in Fallen Earth, but nothing that interferes with my fun, and having fun is my primary criteria for what I play. I’m not planning to post a review of the game as its already been thoroughly discussed on other blogs. If you want some links, the best overview is Syp’s Bio Break posts about the positives and negatives of the game. I’d also recommend checking out A Ding World, Bullet Points, and NecroRogIcon for other bloggers who are playing the game. I’m having a bit of a self-control problem lately with all of the games releasing. First I bought a lifetime subscription to Champions Online, partially on the strength of the beta play that I experiences and partially on my satisfaction with the LoTRO lifetime subscription. Still it is a bit of a gamble, but I wasted more than $200 on my last trip to Vegas so I’m sure I’ll get over it if Champions turns out to be a disappointment. I also had pre-ordered Aion in a moment of weakness from Steam a while back and I recently bought Fallen Earth on the strength of some Twitter comments from Syp, Werit, and Pete. Oh yeah, and I resubscribed to Age of Conan for a month. So that was just the MMOs. I bought Arkham Asylum a little while back and I’m still working on finishing that (about 60% done I believe). I also splurged on Steam and bought Osmos and Majesty 2. Osmos was a great demo and a fun little game (think the 1 phase of Spore), and Majesty 2 is a nice little strategy/simulation game that I hadn’t given any thought to but bought on a recommendation from Jeff Green. Hmmm. Maybe I should get off Twitter, it seems to be costing me quite a bit of money. Of all of these games, I’ve primarily been playing Champions Online. You can find me @BlueKae in the game. I’m really enjoying this game and I’m in the progress of re-making my CoH heroes. My resub month to Conan is both to see if I can play long enough to get out of Tortage, which I’ve never done, and to check out the game on my brand new machine. So far I’ve played less than an hour. 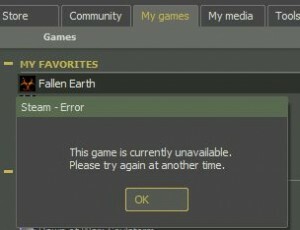 I played Fallen Earth a bit today, about two hours. I’m not sure that one’s a keeper, since the graphics are a bit rough and I’m pretty shallow in that regard, but I’m going to give it the full 30 day try. My one problem so far is I bought it from Steam but the Steam client won’t launch it. Fortunately I can go down the the updater buried in the Steam folders and launch it manually, but I’m not really happy with that workaround. LoTRO and Eve are both in a holding pattern for me right now. In LoTRO I’ve logged in once or twice you see what it looks like in DirectX10 on my new machine and to make sure my house is paid up. In Eve, I’m playing the log in, update training queue, log out game. I’m sure my mood will change eventually and I’ll get back into both games, the trick is not to stress out about it and try to force myself to play. After all this is gaming, not work. Of the six (holy crap six?) MMOs that I have active subscriptions on (2 monthly, 2 lifetime, 2 initial free months, wow yeah that’s six), Aion is the only one I’m not playing. See I’m 35 years old with a wife, a kid, and a job, so my evening gaming time is very precious to me and I don’t want to spend it in a 2-10 hour queue. I’m in no rush though, I’m sure Aion with even out eventually and I’ll play when it does, unless it takes longer than my 30 day free period. If it takes more than the first month for the servers and queues to get to a sane level, I’m not sure if or when I’ll resubscribe. Beyond the multitude of MMOs that I’m dabbling with, I’ve played a bit more Arkham Asylum and it just keeps getting better. The primary worry I had with that game was hitting a wall at some boss battle and giving up on the game. So far all of the boss encounters have been pretty decent, although Killer Croc was a bit of a let down until the very end. Actually the only time I’ve gotten stuck was one of the predator rooms where there were 6(?) armed henchmen and all of the gargoyles were booby trapped, so I had to get used to playing a bit differently. So, if I can just get another 10 hours added to the day, I’ll have time to play everything I want to.